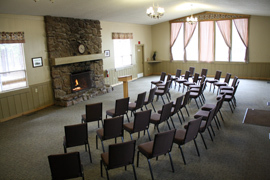 If you need a gathering place, Ponderosa conference facilities can accommodate your group up to 325. 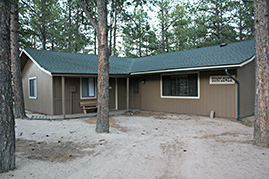 LODGING AT PONDEROSA: Guests staying at Ponderosa may use ONE conference room at no charge. 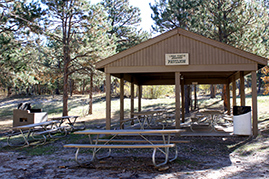 The Allison Pavilion can hold up to 325 people. 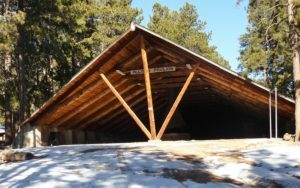 It has a stage that is 15 x40 ft, and a main area that is 50 x85 ft. 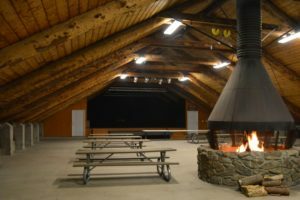 It is open air at one end, not heated, has a fireplace, stage, and storage. See Rates for rental cost. 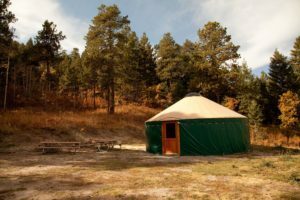 The Aspen Yurt is secluded along with our Aspen Cabins and provides a meeting space that can hold up to 32 people. 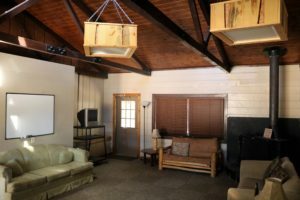 It has electricity and windows, as well as a ceiling fan, space heater, and projection screen, along with outdoor fire pit . 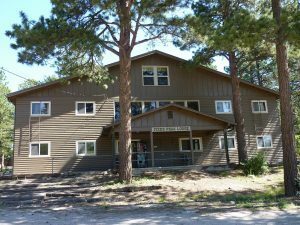 Bear Den can hold up to 89 people. 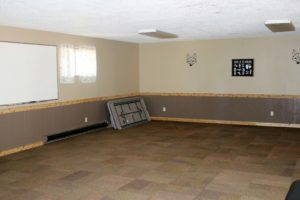 The room is 24 x 48 ft, and it has a TV with DVD player, and a mounted whiteboard. See Rates for rental cost. 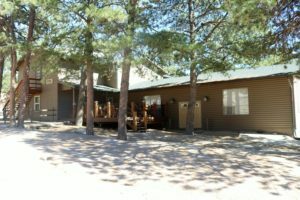 Buckskin has an occupancy of 40 people, its dimensions are 17 x 35 ft, and it has a refrigerator, sink, microwave, TV with DVD, and a mounted whiteboard. 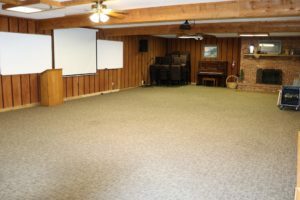 The Cagle Conference Room has an occupancy of 30 people, and its dimensions are 17 x 23 feet. 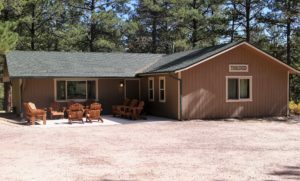 It features a gas fireplace, a microwave, sink, full refrigerator and a piano. See Rates for rental cost. 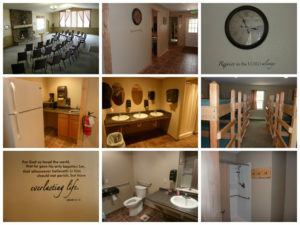 The Chambers Pavilion can hold up to 26 people, its dimensions are 16x24 ft. It is open air and not heated. 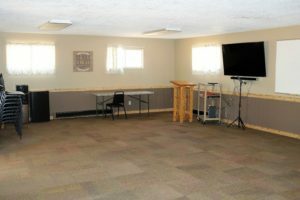 It is conveniently located by the ball fields for use. 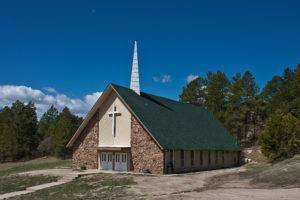 Our chapel has a 300-person occupancy. 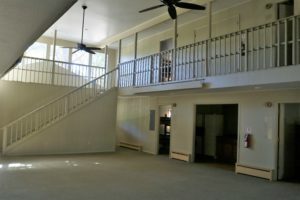 The foyer is 43 x 5 ft., the stage is 39 x 16 ft, and the Room is 39 x 55 ft. The chapel includes a stage, piano, and a mounted screen. 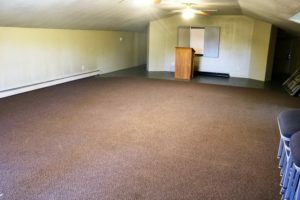 The Cherry Conference Room can hold up to 30 people, and its dimensions are 17x23 ft. It has a gas fireplace, a microwave, sink, full refrigerator and a piano. See Rates for rental cost. 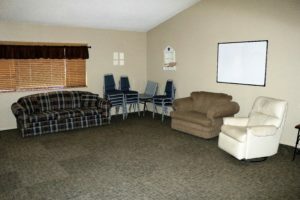 Elkhorn can hold up to 77 people, is 24 x48 ft, has fireplace, piano, TV with DVD, and a mounted whiteboard and projector. See Rates for rental cost. 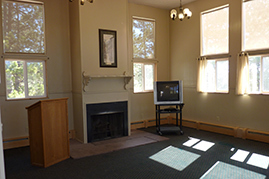 Fox Run holds up to 46 people, dimensions 31 x43 ft, has piano, TV/DVD, projector & whiteboard. 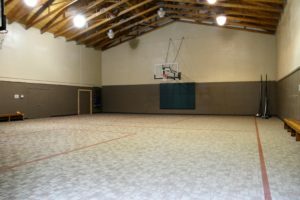 Our gym is a multipurpose facility that can be used for all sorts of activities. 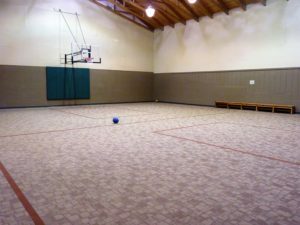 It has a basketball court and can be set up for volleyball. As a conference room, it can be set up to hold up to 203 people, and its dimensions are 50x61 ft. 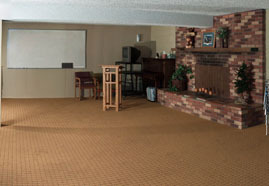 The Holly Conference Room is 25x19 ft, and can hold up to 33 people. It has a woodstove, small refrigerator, microwave, coffeemaker, and a mounted whiteboard. See Rates for rental cost. 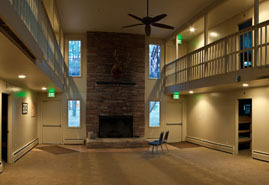 The first-floor conference area is 24 x 45 ft and holds 70 people. 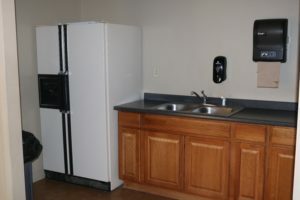 It has a small kitchen with microwave, full refrigerator, sink, and fireplace. See RATES for rental cost. The third floor of Pikes Peak can hold 70 people, and its dimensions are 24 x 45 ft. It has a mounted whiteboard for use. See Rates for rental cost. 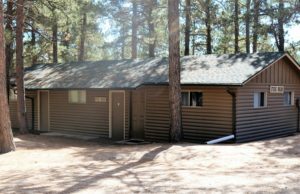 The Pine Conference Room is 24 x28 ft and holds up to 77 people. 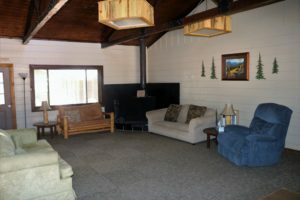 It has a piano, gas fireplace, TV/DVD with mounted projector. See RATES for rental cost. 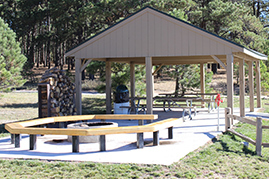 The Portis Pavilion can hold up to 26 people, its dimensions are 16x24 ft, and it is open air, has a campfire pit, and is not heated. 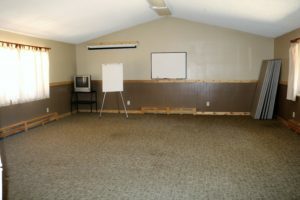 The Sunflower Conference Room 22 x18 ft and holds 26 people. It has a small refrigerator, microwave, coffeemaker, and a mounted whiteboard. See RATES for rental cost. The Tumbleweed Conference Room has an occupancy of 35, and its dimensions are 22x24. It has a mounted whiteboard, a small refrigerator, and a microwave. See Rates for rental cost.